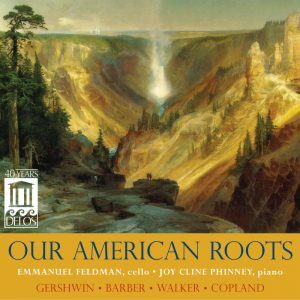 American Record Guide on American Roots — "Excellent" | Delos CD Reviews | Delos Music | Outstanding Classical Recordings for over 40 Years! American Record Guide’s September/October Issue is filled with positive reviews for Delos releases, including our recent release Our American Roots featuring Emmanuel Feldman and Joy Cline Phinney. “This program combines varied aspects of American music in a convincing manner. Feldman and Phinney both have a feeling for all of the different elements that make up our background and put them across the footlights well. …such a subtle feeling for the melodies and harmonies of the blues that he had me weeping. …Feldman and Phinney play them with verve and enjoyment. “Coming after the outgoing Gershwin idiom, I found myself appreciating the ethnic elements in the Barber more than usual. It is played with passion. … This reading is full of rhythmic subtlety and virtuoso playing that these artists express with a rich tone and fine technique.